Gigli del Belvedere is a large villa divided into three apartments, connected by a staircase, for a total of 240 sq. m., ideal for 16 people with 8 bedrooms and 6 bathrooms, a private swimming pool. Gigli del Belvedere is a large villa divided into three apartments, connected by a staircase, for a total of 240 sq. m., ideal for 16 people with 8 bedrooms and 6 bathrooms, a private swimming pool, a garden and wide furnished loggie surrounding the villa. It’s an ideal place for multiple families or groups of friends to have a holiday together whilst maintaining their own privacy. The house is surrounded by 11,000 sq. m. of fenced land which includes various terraced gardens with trees, orchards, tables and chairs, outdoor toys, a ping-pong table and a slide. Overlooking the pool is a panoramic loggia with tables and a barbecue, perfect for outdoor meals. The pool is 7.5 x 3.5 metres with a depth of 1.4 metres, complete with a circular jacuzzi 0.8 m deep. Beach umbrellas, sunbeds, tables and an outdoor shower surround the pool in a paved area. Parking is inside the property, next to the house. The house is divided into three separate apartments on three floors, all connected by a staircase and with a great view of the lake. The large loggia leads to the ground floor apartment which has a large living/dining room with a fireplace, a TV, air conditioning and a well equipped cooking area, one bathroom with shower and three double bedrooms, one of which has air conditioning and its own private bathroom with shower. The first floor apartment also has a large living/dining room with a fireplace and a TV, a kitchen and a large panoramic terrace, part of which is covered, furnished with a table, chairs and a barbecue. This apartment has one bathroom with shower and three double bedrooms, one with air conditioning and a private bathroom with shower. The second floor has a living/dining room with air conditioning, a cooking area, with access to a terrace with a table, chairs and a barbecue, 2 double bedrooms and 2 bathrooms with shower. An external staircase leads to another terrace with sunbeds and a breathtaking 360° view of the area, including lake Bolsena. 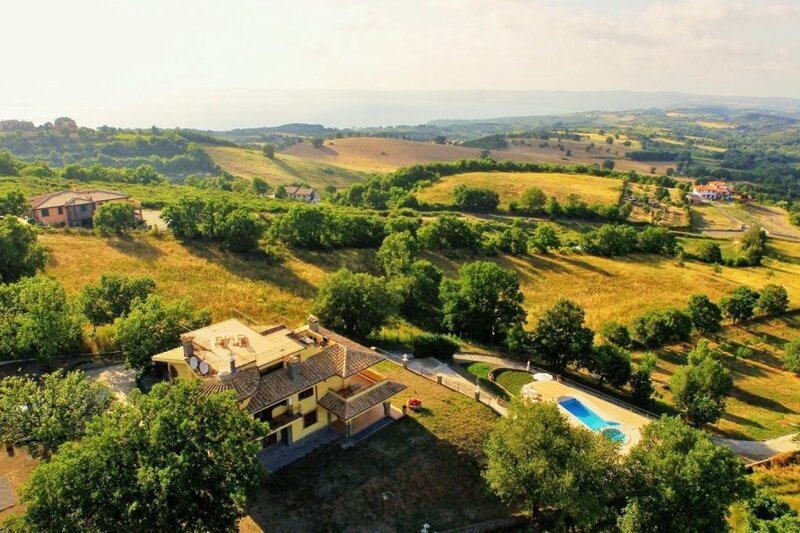 Gigli del Belvedere is immersed in nature, on top of a hill overlooking lake Bolsena and the surrounding countryside, in a quiet, calm location. The villa has Wi-Fi, central heating, air conditioning in one bedroom, a baby bed, high chair and parking within the property. The price includes bathroom, bedroom and kitchen linen and bath towels (changed weekly), water, electricity (not air conditioning) consumption, baby bed and high chair. Upon request and to be paid for on location are: dinners, hired help, wine and food tasting, excursions, thermal baths and hiking. Check in between 15.30 and 19.00. Swimming Pool open from 15/05 to 31/10 and from 10 am to 6:30 pm. Small pets are permitted. It is possible to request up to 4 additional beds in double sofa bed when booking, to be paid for on the spot. The structure is not suitable for groups under 22 of age.